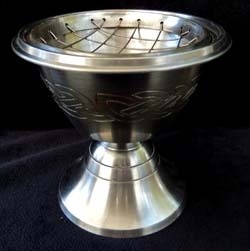 Celtic Knot Pedestal Screen Burner - 4" x 4" for (but not limited to) traditional incense burning. Screen is removable so you can light your charcoal on the screen and then place the screen and charcoal back on the pewter bowl. This is a very nice silver thick pewter piece.